Sunstar Introduces Upgraded Line of Vent-Free Gas Room Heaters With a Sleek New Modern Look - SunStar Heating Products, Inc. The new SunStar® SC18 and SC Model 30 vent-free gas room heaters are designed with soft rounded corners that add richness and elegance to any home, office or hard-to-heat area. The heaters attractive soft but trendy warm cream finish blends into any room décor including the kitchen, living room, den, family room, hallway, sunroom, office area, some workshop areas and manufactured homes for maximum comfort and heating efficiency. Operating without electricity, the SC Model gas room heaters are CSA design certified and come with a 5-year limited warranty on all parts. The heaters are available in natural gas or LP gas and are sold to consumers through Gas Companies, Plumbing and Heating, Hardware or Hearth Product Distributors as well as other outlets. The SC18 Model using natural gas is rated up to 18,000 BTU/Hr and the propane gas model 16,500 BTU/hr. The SunStar® SC30 Model in natural gas is rated up to 30,000 BTU/Hr and the propane gas model 27,000 BTU/hr. Virtually 100 percent energy efficient, both the Model SC18 and Model SC30 room heaters provides for easy wall or floor mounting using minimum space. Rubber knobs on the bottom act as a stand for floor mounted applications and add to the versatility of the line. Both are included as standard equipment. A Piezo Spark Ignition System allows instant start-up of both units without electricity. This helps make the heaters ideal for reliable and efficient heating even during power outages. The upgraded SunStar® line of room heaters comes with user-friendly top mounted manual controls for convenient and easy operation or non-electric automatic thermostatic controls that automatically maintain the desired pre-set room temperature for improved heating efficiency and fuel savings. An exceptionally efficient optional 90 cfm blower assembly option can be added to both the manual or automatic thermostatically-controlled models to improve the distribution of warmth throughout the room for optimum comfort and fuel savings. The manual versions have three heat settings of low, medium and high to allow temperature adjustment as needed to meet the exact comfort level. Other features of the new line include an Oxygen Detection Safety Pilot (ODS) and a Flame Failure Safety Device. The ODS is designed to automatically shut off the gas supply should oxygen in the room fall below minimum level set by the U.S. Product Safety Standard while the Flame Failure Safety Device is designed to turn off the gas in case of flame failure, adding to the safety of the new heating line. Since the units are vent-free, they do not require a chimney or other ductwork making them relatively inexpensive and easy to install. A conveniently located gas inlet permits relatively quick and easy gas hook-up. 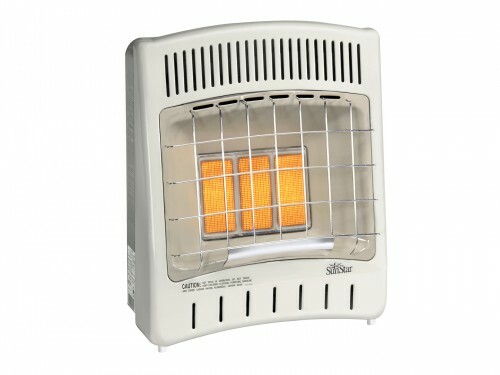 According to Horne, the new heaters provide fireside warmth at an affordable price. “The new heating line is virtually 100 percent efficient due to their vent-free operation that is designed to meet the needs of most supplemental room heating applications,” Horne added. The heaters operate on the radiant heat principle that, like the sun, directly warms people and objects without heating the air first. This principle is similar to the sun’s heat energy, heating the earth’s surface but not the upper atmosphere. 2/3 in. deep. The units weigh 24 and 32 lbs. respectively. Suggested retail prices start at under $225. For more information on the SunStar® SC Model 18 or SC Model 30 Series or other SunStar® patio, garage, infrared or other type of heaters, contact Sunstar Heating Products, Inc., 306 W. Tremont Avenue, P. O. Box 36271, Charlotte, N. C. 28236 U.S.A. or call 1-888-778-6782 or (704) 372-3486, or Fax (704) 332-5843 or E-mail info@sunstarheaters.com. SunStar can also be found on the web at www.sunstarheaters.com. One of two new SunStar® vent-free gas room heaters, the Model SC18 from SunStar® Heating Products, Inc. of Charlotte, N.C. operates without electricity and is CSA design certified for natural gas or LP gas operation. The Model SC18 is rated at 18,000 BTU/Hr on natural gas and 16,500 BTU/hr. on propane gas. Its trendy slim European contemporary but modern look with soft rounded corners blends in and adds elegance to any room décor. The SC30 vent-free gas room heater from SunStar® Heating Products, Inc. of Charlotte, N.C. operates without electricity, is CSA-design certified, is available in either a natural gas or LP gas model and comes with up to a 30,000 BTU/Hr rating on natural gas (27,000 BTU/hr on propane gas). Like the SC18 Model, the SC30 comes with user-friendly top mounted controls for convenient or easy operation or non-electric automatic thermostatic controls that automatically maintain the desired pre-set room temperature for improved heating efficiency and fuel savings. Either unit can be wall or floor mounted using minimum space with a floor stand included as standard.